The essential core of the Uplifting Leaders program is the college football student-athletes that steer our chapters at universities across the country. This past weekend more than 40 individual leaders from 20 college football programs traveled to Atlanta for the 10th annual Leadership Development Conference. The three-day conference was hosted by Uplifting Athletes, and run by Director of Sports Impact Brett Brackett, a former Penn State Chapter President who attended the inaugural conference in 2010. Following a meet-and-greet team dinner Friday night, the conference kicked off Saturday morning with a full day of programming that was driven by Uplifting Athletes four program pillars – Uplifting Leaders, Uplifting Experiences, Rare Disease Awareness and Rare Disease Research. Morning sessions covering the four programs were followed by a panel of former college football student-athletes sharing their stories and advice about making the transition from student-athlete to the professional world. The lively and open discussion was spearheaded by panelists Pat Boyle, Drew Butler, Stephon Morris and Stephen Obeng-Agyapong. To kick off the afternoon, Uplifting Athletes Executive Director Rob Long shared his story about being a rare disease patient and how that shaped him to become a leader, advocate and difference maker for the Rare Disease Community. Long’s hour-long presentation set the table for a tour of the College Football Hall of Fame and an Uplifting Experience where nearly 20 rare disease patients, caregivers and family members teamed up with the student-athletes. “For me Leadership Development Conference 2019 was all about the people. You are surrounded with other college football players from all around the country and get to learn about their own connections with rare diseases and how much it affects us all,” Northwestern Chapter leader Joe Spivak said. “And then to be paired with a family going through the fight at the College Football Hall of Fame puts everything in that much more perspective. Gabe Low, a 17-year-old Hawaii native who was born with a rare genetic disorder, took center stage on Sunday to share his story about why he did the 3,500-mile Ride For Rare Diseases and talked about the impact of awareness created by using his platform. The conference also featured sessions on Lift For Life and Touchdown Pledge Drive and next steps moving forward as these leaders prepare for 2019. Among the 20 schools that were represented in Atlanta, two of those are prospective Uplifting Athletes Chapters. Kent State and New Mexico had student-athletes attending for the first time. Current Chapter leaders from Clemson, Colgate, Davidson, Florida State, Lehigh, NC State, Notre Dame, Penn State, Syracuse, Saint Francis, Penn, Northwestern, Maryland, Princeton, Stony Brook, Fordham and Western Michigan were also in attendance. A special thank you to all our supporters who made this conference possible. With your help, these young men are making a difference in the Rare Disease Community. May your days be filled with Peace, Hope and Joy this Holiday Season! On behalf of the 30 million Americans that comprise the Rare Disease Community, our staff and team of college football student-athletes thank you for your loyalty and support in 2018! It has been a memorable year and we thank you for helping us achieve our mission. Most recently, our team was able to be a part of an Uplifting Experience in Seattle. Former University of Illinois and current Seattle Seahawks wide receiver, Malik Turner, hosted a rare disease patient family for the day at the Seahawks facility. Turner continued to build on that relationship during the NFL My Cause My Cleats campaign by securing tickets for ADNP patient Tony Sermone and his family for the game. One of his cleats had the initials “T” and “S” on the back in Tony’s honor. After the game Malik was able to present the signed cleat he wore in the game to Tony. Without your support this type of Uplifting Experience would not be possible. Would you consider making a year-end donation to Uplifting Athletes? 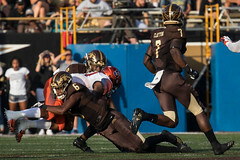 -New Uplifting Athletes chapters established at Western Michigan, Davidson and Lehigh. -38 NFL prospects participated in our Reps For Rare Diseases campaign during their NFL Combine and individual pro day workouts. -Held our inaugural Young Investigator Draft in August at Lincoln Financial Field in Philadelphia and scheduled our 2019 event for March 9th back at the home of the Philadelphia Eagles. The Young Investigator Draft is the result of our ongoing commitment to rare disease research. In 2018 we distributed six $10,000 grants to six individual researchers. 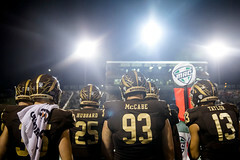 -During the 2018 season, the first ever Rare Disease Awareness Games were held involving Uplifting Athletes Chapter match-ups between Syracuse vs. Western Michigan and Penn vs. Princeton. The chapters wore Uplifting Athletes helmets stickers, #WeTackleRare wristbands and recognized local rare disease patient families during a game break. -We crowned Coach Joshua Eargle from Austin Peay State University as the 11th winner of the Rare Disease Champion Award – given to a leader in college football who has realized his or her potential to make a positive and lasting impact on the Rare Disease Community. We also enjoyed seeing our 10th winner of the award, Shaquem Griffin from UCF, selected in the fifth round of the 2018 NFL Draft by the Seattle Seahawks. These are just a few of the 2018 highlights. We have bigger and bolder plans for 2019. As always, though, we need your help. Please consider giving a gift to support the Rare Disease Community we serve. We can’t do any of this without you! You could feel the electricity in the air Saturday on campus as the Princeton football team prepared to host rival Penn in the final game of the season. The Tigers were on the cusp of an undefeated season and claiming the Ivy League championship. Saturday was also a special day for the Rare Disease Community inside Princeton Stadium. The leaders of the Uplifting Athletes chapters at each university picked this match-up to serve as a Rare Disease Awareness Game to show their ongoing support for the rare disease cause. Players from each team wore Uplifting Athletes stickers on their helmets and pulled on blue #WeTackleRare wristbands in a show of unified support for the Rare Disease Community each chapter champions. And with the help of Uplifting Athletes Executive Director Rob Long and Director Sports Impact Brett Brackett, the Masciantonio family from The For The Love Of Grace Foundation was able to attend their first college football game together. It was a busy Saturday in Princeton, New Jersey. Gianna Masciantonio is a 4-year-old rare disease patient who is diagnosed with a rare brain tumor. Her parents, Joe and Kristen, started the For The Love Of Grace Foundation in honor of their daughter. In between the first and second quarters Gianna, her older brother Dominic, Joe and Kristen and Uplifting Athletes staff were recognized on the field as an extension of the hard work Princeton and Penn football programs put forth to support the Rare Disease Community. Princeton went on to beat Penn to complete their perfect season and hoist the trophy as Ivy League champions. On the field they are competitors, but off the field the Tigers and Quakers football student-athletes share a common bond of shining a spotlight on the Rare Disease Community. Thank you to the athletic departments at Princeton and Penn for supporting the football student-athletes of each chapter to make this a special day that extends well beyond 60 minutes of football.